Free-choice self-feeders protect Deer Chow pellets and provide them to deer whenever they want to eat. Because deer eat at different times several times a day, professionally made free-choice feeders (or even trough feeders) are the best way to feed your deer for maximum intake and antler growth. Spin feeders toss out grain or Deer Chow pellets at timed intervals. They are also good to use with corn to attract deer to the area you want to start feeding with free-choice feeders. One free-choice feeder can comfortably feed 25 free-ranging deer, each consuming an average of 1.5 lbs of AntlerMax Deer 20 per day. Place your feeders along frequently used runways or trails and be sure to have enough so that they do not have to travel more than ½ to ¾ of a mile to a feeder. A good rule of thumb is to provide one feeder per 300-400 acres. Never hunt in a feeding area. To help keep deer on your low or unfenced property, place your feeding areas near the center of your land and no closer than 500 feet from the perimeter. Do not place feeders along fence lines, roads, power lines or in large openings. Lochte Feed offers high quality feeders such as Capsule, West Texas Feeders, Hang M High, Wild Game Innovations, Texas hunter feeders & accessories. Come by Lochte Feed today for your new deer feeder and accessories! 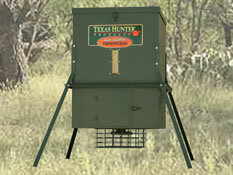 Lochte Feed also has deer blinds, feeder batteries, motors available. This entry was posted on Monday, May 19th, 2014 at 5:48 pm	and is filed under News & Updates. You can follow any responses to this entry through the RSS 2.0 feed. Both comments and pings are currently closed.